The Indian Mars Orbiter Mission met its first setback last night when the planned 4th burn in earth orbit was achieved but did not or could not impart the extra velocity that was planned. The orbit rose from about 71,000 km (apogee) to 78,000 km instead of the planned 100,000 km. A supplementary burn is planned for the early hours of 12th November (burns are scheduled for when the spacecraft is near perigee and within clear and easy range of tracking stations). TOI: The first orbit-raising manoeuvre of India’s Mars Orbiter Mission was performed at 01:17 hrs Indian Standard Time (IST) early on November 07, 2013) when the 440 Newton Liquid Engine of the spacecraft was fired for 416 seconds by commanding it from Spacecraft Control Centre (SCC) at Isro Telemetry, Tracking and Command Network (ISTRAC) at Peenya, Bangalore. With this engine firing, the spacecraft’s Apogee (the farthest point to Earth) was raised to 28,825km. The second orbit raising manoeuvre of MOM was at 02:18:51 hrs(IST) on Nov 8, 2013.The change observed in Apogee was from 28,814km to 40,186km. The third orbit raising manoeuvre of Mars Orbiter Mission spacecraft, starting at 02:10:43 hrs on Nov 09, 2013, was successful. The change observed in the Apogee was from 40,186 km to 71,636km. There has been some criticism (within and outside India) from the usual suspects about the frugally-engineered, Indian, Mangalyaan Mars Orbiter mission as “being too expensive” for a developing country like India. I tend to discount these voices which merely continue the long, retrograde and shameful tradition of the Luddites. Some of these voices are of those who would like humankind to return to the trees. Others are of those who feel threatened by the idea of “backward nations” moving into space. Reaching Mars is not that easy. More missions have failed than have succeeded. 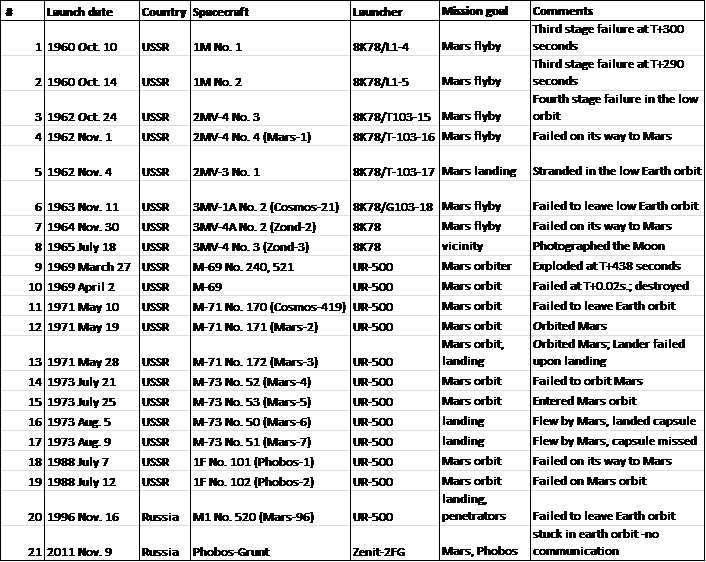 The full list of Mars missions is here. There are many crucial steps left for the Mangalyaan mission to achieve and success is far from assured. TOI: India’s Mars Rover Mission (MOM) named ‘Mangalyaan’ is the 42nd mission aimed at understanding Mars. Out of the 41 missions so far, 25 have been declared failures and only 16 have been a success. Even the latest Phobos-Grunt/Yinghuo-1 launched by Russia/China was a failure as it got stranded in the earth’s orbit. Close on the heels of ‘Mangalyaan’ being sent into space by India, the United States (US) is also gearing up for the MAVEN mission to be launched on November 18, 2013. The mission is intended to be a step towards ‘unravelling the planetary puzzle about Mars’. The US is also gearing up for the Mars Rover 2020 mission to understand ‘Martian atmosphere’. Underlying all missions is the vision of Mars one day being inhabited by humans. And that vision transcends the petty and mean criticism of those who can only see a “glass half empty”. Last night the 3rd of five rocket burns was completed to lift the earth orbit of Mangalyaan from 40,186 km to 71,636 km (apogee). The fourth and fifth burns are planned for November 11th and 16th to raise the apogee to 100,000 km and then to 192,000 km. The 6th burn will be to leave Earth’s orbit and insert the spacecraft into a trajectory towards Mars. The Trans-Mars injection is expected around 12.42 AM on December 1st. 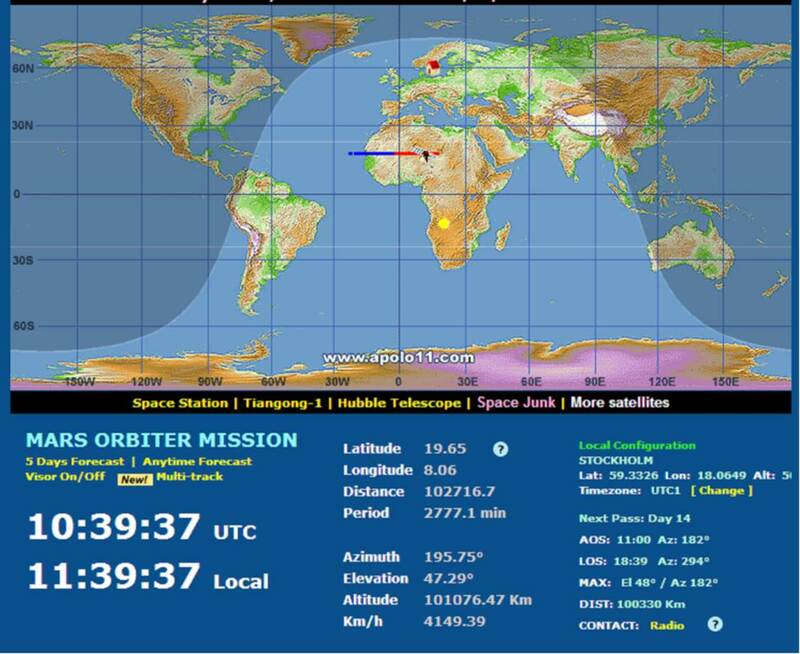 ISRO: The third orbit raising manoeuvre of Mars Orbiter Spacecraft, starting at 02:10:43 hrs(IST) on Nov 09, 2013, with a burn time of 707 seconds has been successfully completed. 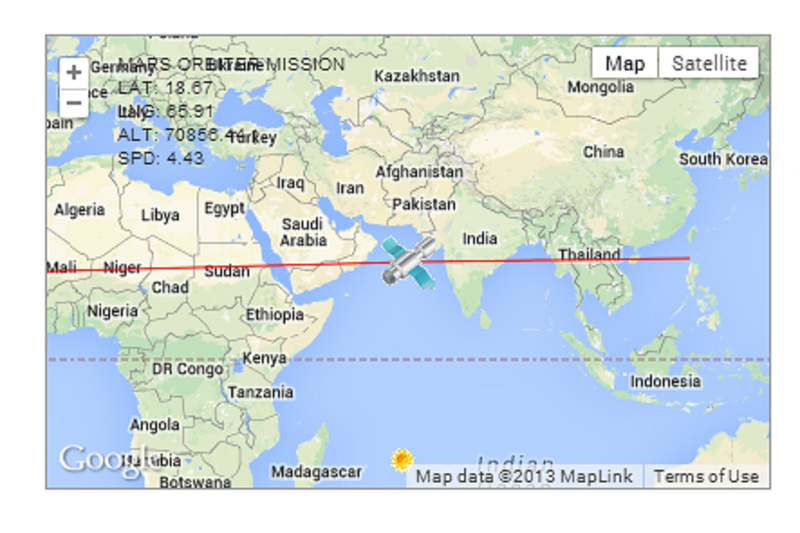 The observed change in Apogee is from 40186km to 71636km. The Launch Vehicle – PSLV-C25 will inject the Spacecraft into an Elliptical Parking Orbit with a perigee of 250 km and an apogee of 23,500 km. With six Liquid Engine firing, the spacecraft is gradually maneuvered into a hyperbolic trajectory with which it escapes from the Earth’s Sphere of Influence (SOI) and arrives at the Mars Sphere of Influence. When spacecraft reaches nearest point of Mars (Peri-apsis), it is maneuvered in to an elliptical orbit around Mars by firing the Liquid Engine. The spacecraft then moves around the Mars in an orbit with Peri-apsis of 366 km and Apo-apsis of about 80000 km. The spacecraft is injected into an Elliptic Parking Orbit by the launcher. With six main engine burns, the spacecraft is gradually maneuvered into a departure hyperbolic trajectory with which it escapes from the Earth’s Sphere of Influence (SOI) with Earth’s orbital velocity + V boost. The SOI of earth ends at 918347 km from the surface of the earth beyond which the perturbing force on the orbiter is mainly due to the Sun. One primary concern is how to get the spacecraft to Mars, on the least amount of fuel. ISRO uses a method of travel called a Hohmann Transfer Orbit – or a Minimum Energy Transfer Orbit – to send a spacecraft from Earth to Mars with the least amount of fuel possible. The spacecraft leaves Earth in a direction tangential to Earth’s orbit and encounters Mars tangentially to its orbit. The flight path is roughly one half of an ellipse around sun. Eventually it will intersect the orbit of Mars at the exact moment when Mars is there too. This trajectory becomes possible with certain allowances when the relative position of Earth, Mars and Sun form an angle of approximately 44o. Such an arrangement recur periodically at intervals of about 780 days. Minimum energy opportunities for Earth-Mars occur in November 2013, January 2016, May 2018 etc. The spacecraft arrives at the Mars Sphere of Influence (around 573473 km from the surface of Mars) in a hyperbolic trajectory. At the time the spacecraft reaches the closest approach to Mars (Periapsis), it is captured into planned orbit around mars by imparting ∆V retro which is called the Mars Orbit Insertion (MOI) manoeuvre. The Earth-Mars trajectory is shown in the above figure. 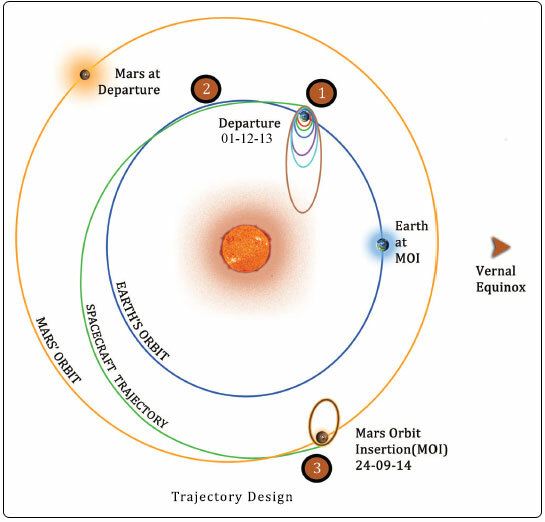 ISRO plans to launch the Mars Orbiter Mission during the November 2013 window utilizing minimum energy transfer opportunity. Comet Shoemaker–Levy 9 broke apart and collided with Jupiter in July 1994, providing the first direct observation of an extraterrestrial collision of Solar System objects. The collision provided new information about Jupiter and highlighted its role in reducing space debris in the inner Solar System. But a much closer event could be in the offing for next year. A newly discovered comet has been found to have an orbit which takes it extraordinarily close to Mars in October 2014 and the possibility of an impact is 1 in 600. The size of the comet is still uncertain but some estimates are of the nucleus being 50 km in diameter. An impact crater on Mars – if an impact occurs – could then be about 500 km in diameter. C/2013 A1 (Siding Spring) is a comet originating from the Oort cloud and was only discovered in January this year by Robert H. McNaught at Siding Spring Observatory in Australia, using a 0.5-meter Schmidt telescope. By looking at observations made before the comet was identified as a comet on 3rd January, NASA states “Pre-discovery observations located in the archives have extended the observation interval back to Oct. 4, 2012”. On Oct. 19, 2014, Comet 2013 A1 (Siding Spring) will pass extraordinarily close to Mars, almost certainly within 300,000 km of the planet and possibly much closer. Our current best estimate has it passing about 50,000 km from the surface of Mars. This is about 2.5 times the distance of Mars’ outermost satellite Deimos or less than twice the Earth close approach distance of 2012 DA14 on February 15, 2013. Since the observation span available for orbit determination is still relatively short, the current orbit is quite uncertain and the nominal close approach distance will change as additional observations are included in future orbit estimates. Currently, Mars lies directly within the range of possible paths for the comet and we can’t exclude the possibility that the comet might impact Mars. Our current estimate for the impact probability is less than one in six hundred and we expect that future observations will allow us to completely rule out a Mars impact. Although the current heliocentric orbit is hyperbolic (i.e., eccentricity greater than one), the orbit is elliptic when expressed in the frame of the solar system’s barycenter. After more than a million year journey, this comet is arriving from our solar system’s distant Oort cloud. It could be complete with the volatile gases that short period comets often lack due to their frequent returns to the sun’s neighborhood. During the close Mars approach, the comet will likely achieve a total visual magnitude of zero or brighter as seen from Mars-based assets. The attached illustration shows the comet’s approximate, apparent visual magnitude and its solar elongation angle as a function of time as seen from Mars. Because the comet’s apparent magnitude is so uncertain, the brightness curve was cut off at apparent visual magnitude zero. However, the comet may get brighter than magnitude zero as seen from Mars. From Earth, the comet will not likely reach naked eye brightness but it could brighten to visual magnitude 8 as seen from the southern hemisphere in mid-September 2014. And now for the colonisation of Mars..
Perhaps it is commercial – and private – enterprises which will truly open up the new frontier. After SpaceX and its Dragon and Virgin Galactic yet to come, Mars One plans for the colonisation of Mars. In 2022, a crew of four will embark on a seven-month flight to the Red Planet–and stay there for the rest of their lives. A new team will make the trip every two years, enabling the colony to grow. Whether the concept of making it a media event to finance the adventure will work remains to be seen. I suspect the financing challenge rather than the technical challenges will be paramount. 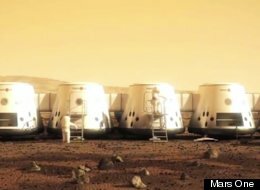 Mars One plans to establish the first human settlement on Mars by April 2023. The first crew of four astronauts emigrate to their new planet from Earth, a journey that takes seven months. A new team will join the settlement every two years. By 2033 there will be over twenty people living, working and flourishing on Mars, their new home. A manned mission to Mars is one of the most exciting, inspiring and ambitious adventures that mankind can take on. We see this as a journey that belongs to us all, and it is for this reason that we will make every step one that we take together. This will also be our way to finance the mission: the mission to Mars will be the biggest media event ever! The entire world will be able to watch and help with decisions as the teams of settlers are selected, follow their extensive training and preparation for the mission and of course observe their settling on Mars once arrived. The emigrated astronauts will share their experiences with us as they build their new home, conduct experiments and explore Mars. The mission itself will provide us with invaluable scientific and social knowledge that will be accessible to everyone, not just an elite select few. Join us in this adventure. Put it on Facebook, Twitter, LinkedIn or whatever platforms are available to you, and spread the word! The Mars One team has worked on this plan since early 2011. That first year saw us research the feasibility of the idea extensively and exhaustively, scrutinizing every detail with countless specialists and expert organizations. In this analysis we not only included the technical elements, but also comprehensively discussed the financial, psychological and ethical aspects. We have met with several established, international aerospace companies who can design and deliver the essential hardware components for the Mars mission. These have written letters of interest that support our plan. We have an impressive list of people who support the mission to Mars, our ambassadors. One of them is professor dr. Gerard ‘t Hooft, Physics Nobel Prize winner of 1999. We were this thorough in our preparations for a reason. A project as ambitious as sending a manned mission to Mars can only be presented credibly when it can stand on its own two feet. We have a feasible plan and a way to finance it. We are ready to go, will you join us? Posted in Behaviour, Space | Comments Off on And now for the colonisation of Mars..
On Tuesday, 22 November at 20:25 UT, ESA’s tracking station at Perth, Australia, established contact with Russia’s Phobos-Grunt spacecraft. This was the first signal received on Earth since the Mars mission was launched on 8 November. ESA teams are working closely with engineers in Russia to determine how best to maintain communications with the spacecraft. Phobos Grunt is dead and silent …..
SpaceflightNow: Major General Vladimir Uvarov, a former space expert in the Russian military, told the Rossiiskaya Gazeta newspaper he has lost optimism in Phobos-Grunt’s chances for recovery. “In my opinion, the Phobos-Grunt probe has been lost. This probability is very high. At any rate, it is much higher than the chances for reactivating the probe,” Uvarov told the newspaper. …. With 11 tons of toxic hydrazine and nitrogen tetroxide propellant still in its fuel tanks, Phobos-Grunt’s potential re-entry is stirring concerns of space experts after two high-profile returns of large satellites in September and October. The jinx on Russia’s probes to Mars continues. Phobos-Grunt launched successfully last night but failed to enter its departure trajectory when two engine burns failed – presumed due to computer problems. It is now in a “parking” orbit and the problem needs to be fixed within 3 days when its batteries will run out. The fuel tanks are still in place for the craft’s own thrusters and there is still thought to be some hope. If the problem cannot be fixed it will be the fourth successive failure of a Russian Mars mission. Much Russian news just now from the Nord Stream pipeline in the Baltic going live today to an ambitious and critical Mars mission which will launch late today (November 8th). Russia’s last interplanetary launch of a probe to Mars in 1996 failed at launch. Prior to that in missions to the larger of Mars’ 2 moons, Phobos 1 was launched on July 7, 1988 and Phobos 2 on July 12, 1988. Communication with Phobos 1 was lost in September 1988. Phobos 2 operated normally till it was within 50m of the surface of Phobos and again communication was lost in March 1989. In the meantime the US Mars Rover has operated on Mars for thousands of hours, Chinese and Indian probes have reached the moon and a Japanese probe has brought back some minute quantities of matter from an asteroid. The Russians have been short of financing and are now trying to regain the pre-eminence they once had. To have the Chinese planting flags on the moon in 3 or 4 years would be unbearable. Russian missions to Mars have never yet been completely successful and the launch on November 8th as part of the Phobos-Grunt (Фобос-Грунт meaning Phobos -soil) project is carrying a great deal of Russian prestige and – more importantly – the future of the Russian space program.